I called a local excavator that digs ponds and does land clearing. He refused to give me a set fee. By the hour? By the yard? by the square foot? He basically said he could do a pond from $2500 to $250,000. I said I have $5,000. Still wasn't specific on what that money would get me as an end result size/depth. So I did get a few answers. First and most important was do I need a permit? No! Then will it fill with water and hold it or do I need a liner? Answer, we should hit a vein and it should retain water because there is a clay content present. Good! Now. I'm not willing to give him some money and end up arguing about whether or not I got $5k worth of pond out of him. I have no scale to judge the value of the work done. Now I figured I'd just test the soil a little on my own. 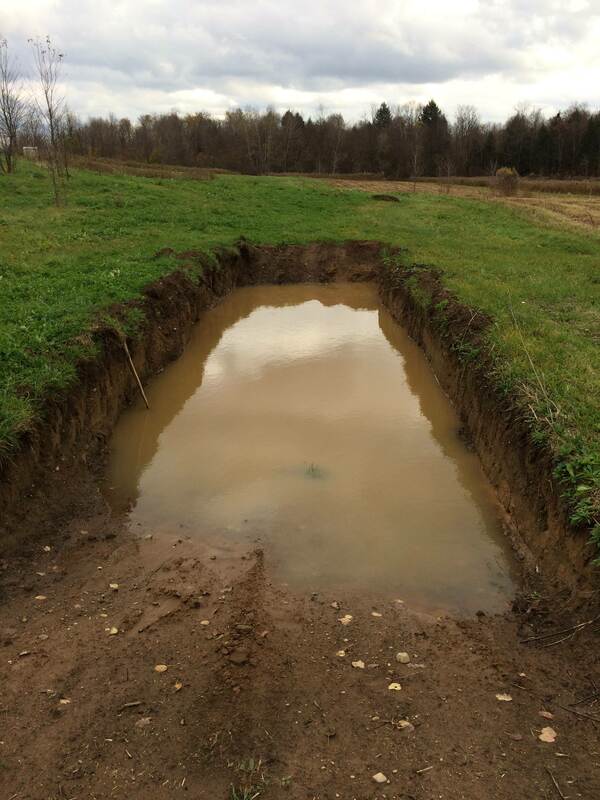 dig a sample pond and see if it fills up and holds water. Yeah, I got a little carried away. 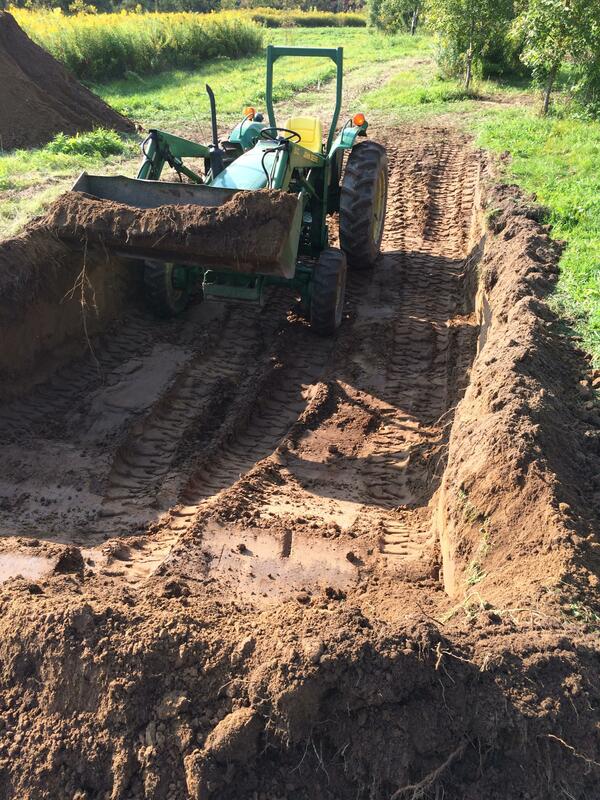 I ended up with a hole 2 tractor widths wide and two lengths long about 5' deep. No water. I got all of it done in two hours. The 1050 does the work without much grunting. 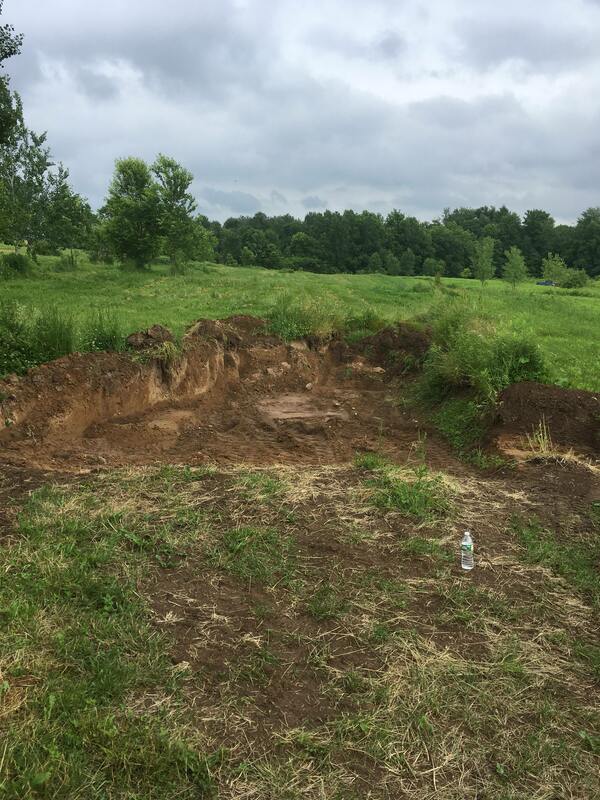 This leads me to the conclusion that I can dig my own pond as I want it in about 30 hours and about 60 gallons of diesel. It will be kind of heart shaped with an island near the grotto and shallow for swimming and deep on the opposite end to hopefully support a fish stock. I can go as long and deep as I have time and money for. I even have a large trash pump so I can pump it out to do more later if needed. I am willing to install a liner if I have to. This is the driest time of the year here and I usually have a very high water table. I'm very surprised it isn't filling yet. 4 more feet down I'm sure it will. You can see some moisture in the soil in the center in this picture. Now I have another issue. What should I be doing with the dirt that comes out? It's worthless as a bank to retain water as it's mostly sand. I hate to have to move it twice. As it stand I'll need a dump truck/or trailer to haul it or it'll take forever one bucket at a time. I think I'll be building some ramps for the hillbillly hotrod, and filling in a bunch of holes in the yard from the electric and water lines settling. It's a lot of dirt!! I just realized these pictures are from before I was done digging. I should get a recent picture!! Re: Project Oasis, New pond??? I can't believe he could not provide you with a hard bid, or an hourly rate. Smart move not hiring him. Definitely put down a felt liner and then the rubber liner. The State of Nebraska created a lake at Ponca State Park that used a reinforced bentonite liner. It seems to be working well. Since you are going to have fish in your pond and since it freezes where you live you need 12' of depth to more or less avoid winter kill. My reservoir is 12' in places and also lets water flow through and leak out the bottom of the dam so there is some movement and oxygenation going on I am told. We are not as cold as where you live I would guess but maybe checking with the local game and fish people would get some idea as to how deep the water should be. We repaired our dam a few years ago and used raw bentonite to try to get a good seal in the area the old drain pipe was. I works pretty well but we have access to the mining of it about thirty miles away and it doesn't cost much for a couple of dump truck loads that we used. Our reservoir is 5 acres and about 6' average depth with an area that is 12' as I noted above. It looks like pretty good dirt so I would put it on a field if you have one big enough. XJ, what kind of fish are we talking about? How thick does the ice get on lakes closest to you? I seriously doubt you'd need 12' of water. Thanks Wolfy for the link. The rpe liners are 24 and 30 mil thick. I was considering a vinyl billboard tarp which they do offer as pond liners but they are 17 to 22 mil. I was talking about going 30'. That was with an excavator. I was thinking of renting one but money is tight. I can take 5' at a time and dig it in layers. I really want it deep enough for a high diving board. 15' would do. Fish usually stock themselves. I hear the birds bring the eggs in on their feet? I know we never stocked the big pond on the farm and it had bass and trout in it. Perch and sunfish too. No catfish or carp though. We always put aqua shade in and it it kept the water crystal clear, blocking the UV so the algae couldn't grow. It was a great swimming pond, no chemicals so you could open your eyes and clearly see where you were. I seriously doubt you'd need 12' of water. There have been several shallow ponds built in our area and 12 feet seems to be the depth that offers the best for a viable fish population. The depth prevents plants from starting growth in the first place since when they die they produce carbon dioxide. 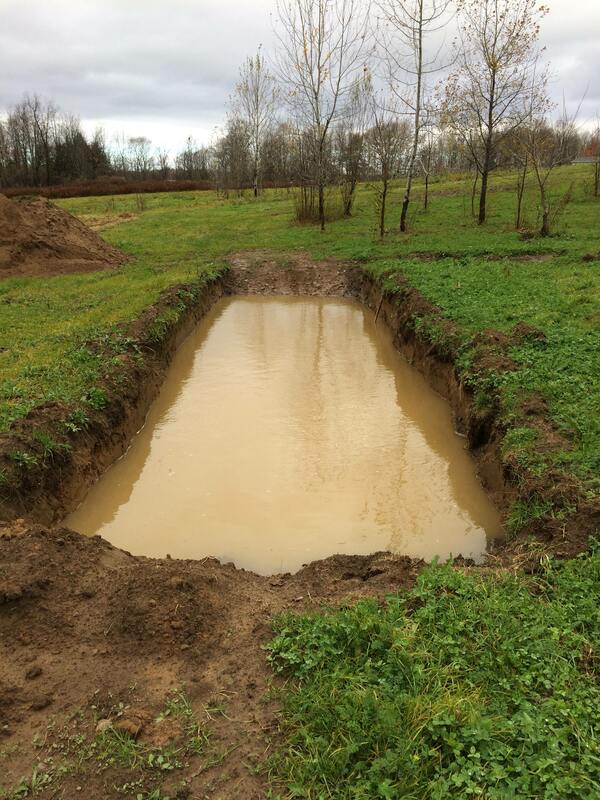 "When it comes to farm pond design, build ponds deeper with an average depth of something like 10 feet. 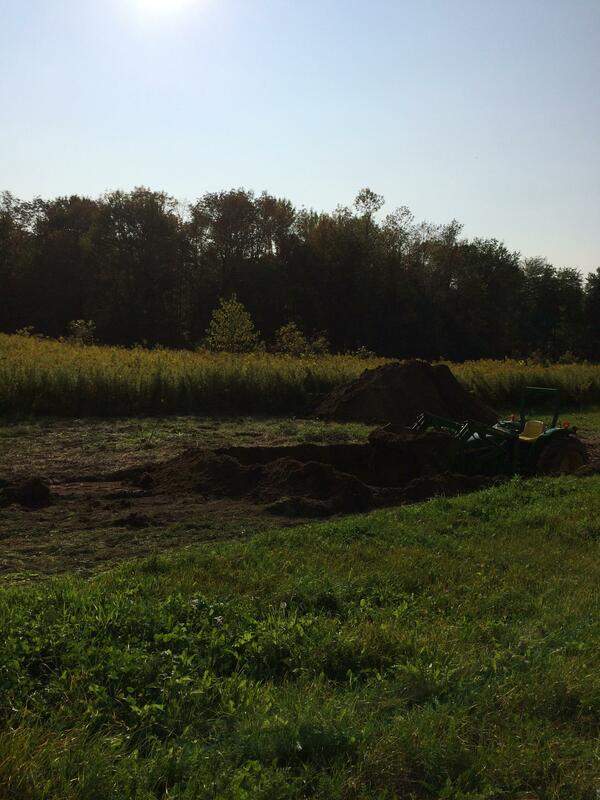 Shallow ponds allow for more shallow vegetation to grow, which can die off in the winter months." "Shallow lakes are probably the most likely candidates for winterkills. But deeper small lakes have experienced fish kills in the winter due to lack of oxygen. Many reservoirs were created by flooding land by placing some type of dam in a river system. Most of these types of lakes will have a higher than normal amount of decaying vegetation on the bottom because they are essentially flooded lowland. They also are typically quite shallow. Heavy ice and snow cover do not allow sunlight to penetrate which means there will be no photosynthetic activity to produce oxygen. So instead, oxygen is consumed as plants die off and carbon dioxide is produced." From another site: " Winter freeze is the main killer of fish. It?s not that the fish actually freeze in the ice, they just get robbed of their oxygen. An average Michigan pond ice can reach 12'' thick and ad some inches of snow onto that and sunlight will be prevented from penetrating. 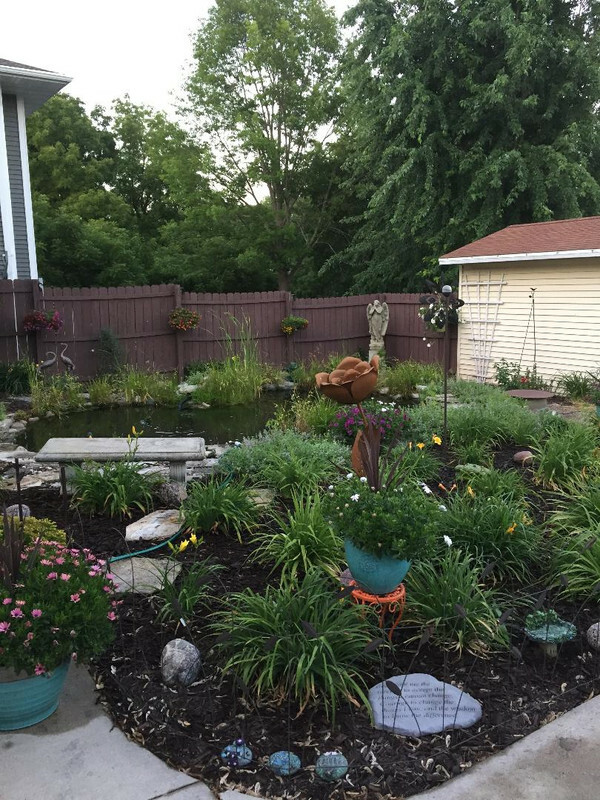 If your pond is shallow, the lack of sunlight will cause the plants to die. As a result, the decomposition of aquatic vegetation will deplete oxygen from the water reducing photosynthesis and your fish will die." 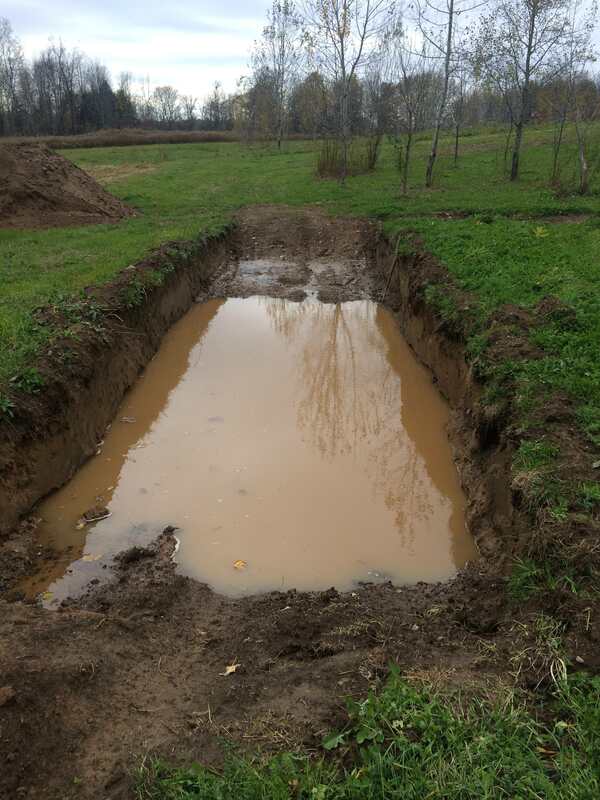 What most articles state is that a deep pond allows less vegetation to grow on the bottom and that helps with the oxygen content of the water. Great info. I wonder if it'd be worth the expense for a solar water pump and fountain? Almost all of the sites mention that one way to prevent a lack of oxygen is go have some open water. I would think a solar pump and fountain would work in most winters unless it was a long cold spell. ln severe cold the opening might freeze over at night. Worth looking into. Solar pumps would work well in areas where there is abundant sunshine, but we are seldom blessed with much of it during the months of January & February. Small windmills seem to do the trick here, but a combination of the two would be ideal. That is a very nice site. I bookmarked it. I like the air compressor idea. I always wanted a fountain though. We have rain coming Tuesday and Wednesday this coming week. I'm going to get as much done as I can and hope the water will stay in till spring. Updated pics will come soon. Diesel was the same price as gas. $2.69 a gallon(89 oct). That's not bad it has been more for a long time. Just be careful working in that sandy trench with the front loader. Don't get buried. And if you get stuck, you'll need a D8 Cat to pull you out! Well, we had 24 hours of very steady rain and this is all I got. Total of just over 3" of rain. Just a little over a foot of water. 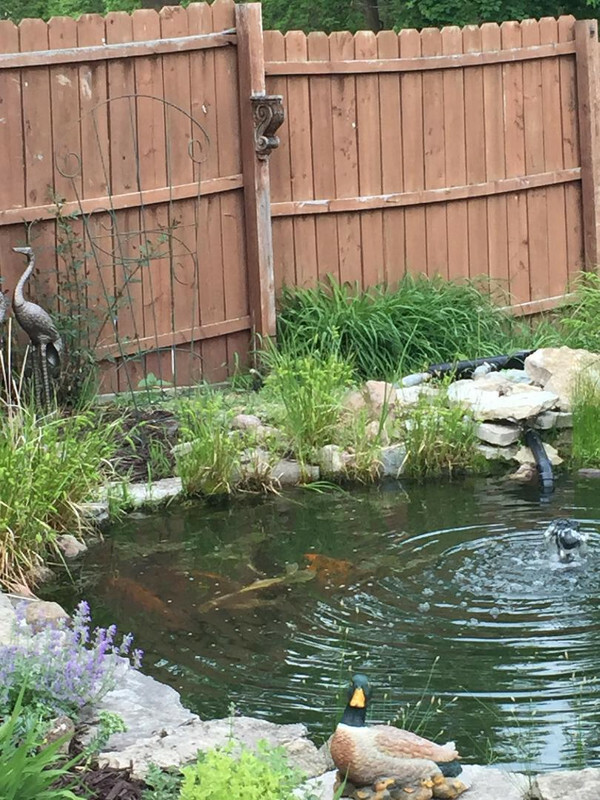 Back when I had a koi pond, we visited the local koi "fish farm" a few times. He had two 145,000 gallon rearing ponds out back. Both were lined with black, 2-mil plastic. They cost a fortune...but then so did his koi. I priced out the 13 mil I will need at $1400. Not bad for a D.I.Y. It would cost way more to have it done. I wonder if 2 mil would last? I think 2 mil is much too thin for a large pond. In reviewing a few sites it seems that 15 mil is about the low end and 30 mil the high end on large liners. Even with a thick liner you have only a 20 year life span. Why do you need a liner? Ponds down here, unless they're small koi/goldfish ponds in someone's yard, are not lined. It depends ALLOT on soil structure. 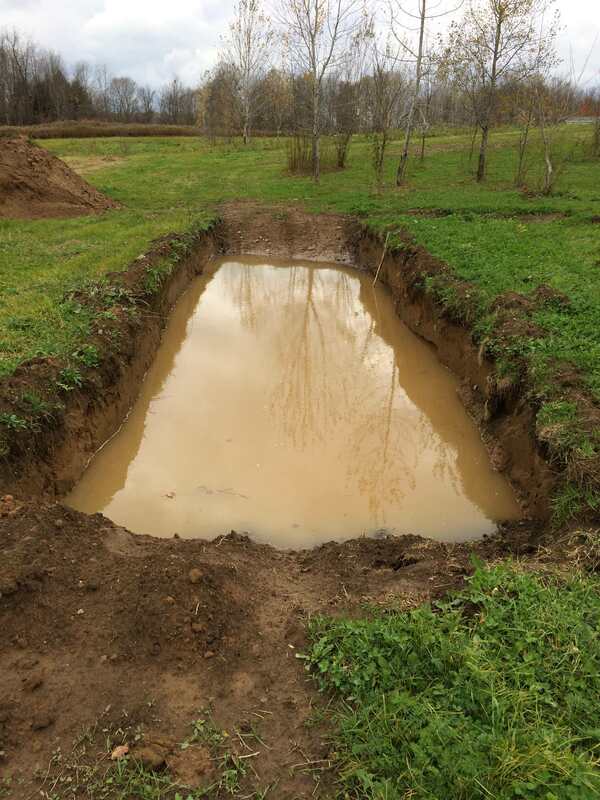 If the soil is clay-based (very fine, like bentonite) it will most likely not need a liner because when clay is wet it becomes almost impermeable and seals over, so the water remains on the surface. On the other hand, sand or sand-based soils are more coarse, which allows surface water to disappear and quickly migrate to the subsoil structure. It also depends on the amount of water that comes into the pond. Mine has some inflow most of the year and the only time we need to add water from the irrigation system is when we are taking out in excess of the inflow, which goes on about four months of the year. Our reservoir has no liner but there is a lot of bentonite clay in it. It leaks a bit but will generally be close to full all winter. This is the reason Wolfy. I can park my 40 ton big rig in the front lawn without making ruts most of the year. The rain just flows out of it as it's almost entirely beach sand. I do get a different soil out back where the pond is. The ground water level is still about 10 feet lower then the bottom of this hole. SO even digging down 10 more feet the water level will never be higher than that leaving high walls. The other thought I had. Maybe I can make a giant area of deep depression that can be landscaped and more private from neighbors eyes. Then have the deeper pond area in the center of that. I have a lot of ground to work with and the time to mess around with it. The end result is raising the value of the home/property. That was a typo. I meant 20 mil. Okay, now it makes more sense. I guess the thicker the better depending on the type of material the liner is made from. $$$ issues would take it to the best life for the least money. I assume the water stayed in from the photo you posted on 10/30 to today and this is just more water from the continuing rain. ?? It will be interesting to see how long it takes to settle and clear. This may be a stupid idea, but back in the day (early 70's) my parents wanted to enlarge our stock pond. They got advice to line it with clay. As long as it stayed wet it would hold water. Not stupid at all. This is done where I live to seal dams and pond bottoms. The clay is bentonite and is abundant locally. Don't know about where xj35 is. YES!! I didn't expect this amount of water to accumulate until after winter thaw. I am excited to see it filling so well. We are getting more rain this whole week. If this maintains water up until December 1st I may be lucky enough that it will hold water. The excavation guy thought it would by looking at a handful of soil. This could be a very exciting money saver! I am doubtful but enjoy monitoring this thing. 4 more inches, it really shows at the lower right side of the edge. 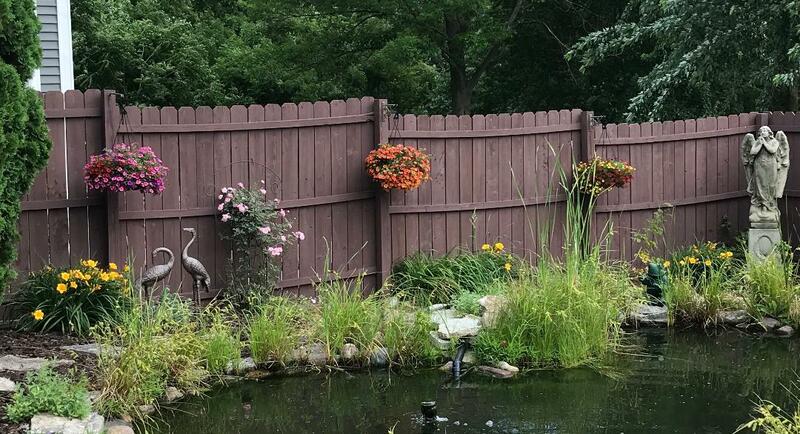 I have a couple of ponds, one is only seasonal, and dries up during the hot summer months, the other is spring fed, it currently has a big gap in the dam, repairing that is almost an annual project. Ponds are neat they attract all sorts of wild life. I need to get a new photo. The sides have collapsed a lot. I don't care they shouldn't be 90 degrees for a pond anyway. I think it shows that there is a lot of water moving through maybe. So the decision has been made. We are going small and using as a swimming pool rather than fish livery. Although fish are still welcome as it will be a pond after all. I'm going for passive filtration via plant life/U.V. and oxygenation with a fountain. I have recently gone almost twice as wide. I will be getting deeper and more round over the next few weeks. Trying to have this done by August 4th as we are having a huge party. Looks like it'll be around $800 for a liner and the quickest easiest solution for my area. There doesn't seem to be any bentonite clay available locally. Are you going with a liner like you thought about awhile back? No. The more expensive lake liner. I think it's 17 mil. That's why this is going to be much smaller than I wanted it originally. Look into rubber roofing. Find a roofing company that tears off old roofs, you might find it cheap. I used it for my little garden koi pond in 2004. The edges that aren't covered by rocks or vegetation show no signs of sun or weather fatigue. If you are going to stick with plastic, make sure you use silo cap, which is more UV resistant. 5 or 6 mil is what you want. Might be less expensive here. We live in Wisconsin, the koi winter in the pond. The pond is 11x17 -4 feet deep. I use a small fountain pump to keep an "otter hole " to let gasses escape. My back up is a stock tank heater if it falls -10 below zero, but I only plug it in when I need it. Pond guy.com has aeration options that would work better for you. JeffG, You're awesome. I should have known about this stuff having worked large modern diaries for 18 years. That 60x100 would be perfect for the size I want. Beautiful backyard. What is your secret to keeping weeds out of the mulch? Thanks. The silo cap also goes down on the bare ground, cut X's and plant perennials in the holes. Mulch the rest of the cover. Hand pull the stray weeds. It's a lot of work, but it's our little bit of heaven.